Clockwise, from top left: Steven Libby, 49, of Warren; Michelle Libby, 47, of Warren; Ryan Carballo, 34, of Old Orchard Beach; Joseph Thurston, 30, of Friendship; Amanda Thurston, 29, of Friendship. ROCKLAND, Maine ― A Friendship couple pleaded guilty last week to trafficking fentanyl in the midcoast, while two other members of their family pleaded guilty to similar charges last year. 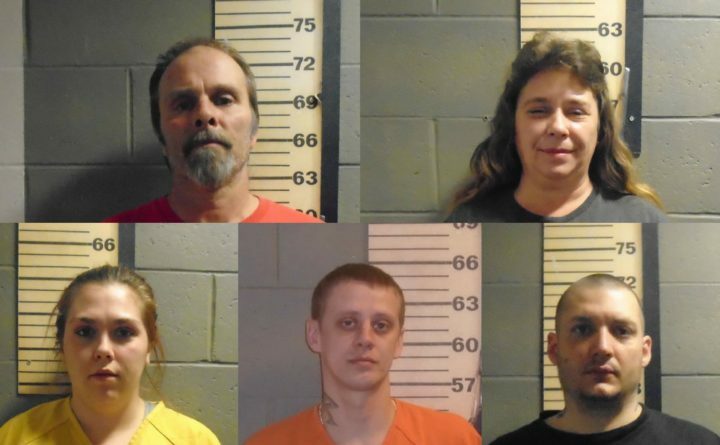 Amanda Thurston, 30, and Joseph Thurston, 31, were two of five family members arrested following a bust by the Maine Drug Enforcement Agency in March 2018. At a hearing on Friday in Knox County District Court, the couple pleaded guilty to one count each of trafficking fentanyl, according to court documents. A second charge of trafficking fentanyl against Amanda Thurston was dismissed. She was sentenced to four years in prison, with the entire sentence suspended. She will be on probation for three years. Joseph Thurston is awaiting a sentencing hearing. Amanda Thurston’s parents, Steven Libby, 50, of Warren and Michelle Howe, 47, also of Warren, were arrested in the same bust. In December, Howe was sentenced to four years in prison with all but one year suspended on an illegal possession of a firearm charge, according to court documents. Two aggravated drug trafficking charges were dismissed. Libby pleaded guilty to two charges of aggravated drug trafficking and an illegal possession of a firearm charge in December. He is scheduled for sentencing in May. Libby and Howe’s son-in-law, Ryan Carballo, 35, of Old Orchard Beach, pleaded guilty to a drug trafficking charge in September and are scheduled for a sentencing hearing in March, according to court documents.